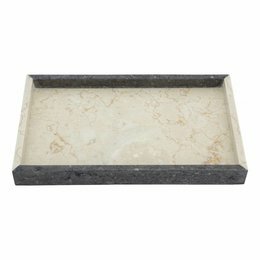 From our Aguna set comes this beautiful tray made of cream marble with two sides of black marble. Length x Width x Height is 30 x 18 x 3 cm. 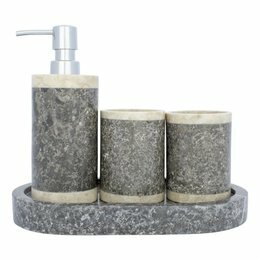 This 4-piece bathroom accessory set Medang consists of a Tray, Soap Dispenser and two Toothbrush Cups. 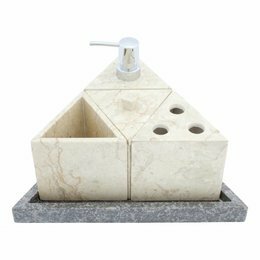 This 6-piece bathroom accessory set Imelda consists of a Tray, Soap Dispenser, Toothbrush Cup, Toothbrush Holder, Soap Dish and a Jewellery Box. 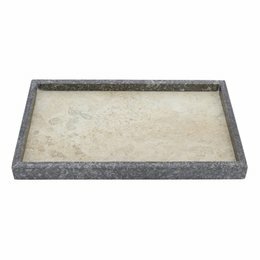 A Tray from our luxurious Imelda set of which all items are made of cream and gray marble gives joy to your eyes. Dim. 37x22x3cm. 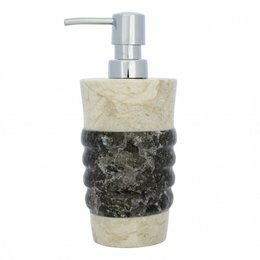 This elegant soap dispenser made of a combination of gray and cream marble gives a very luxurious look to your bathroom, kitchen or toilet. 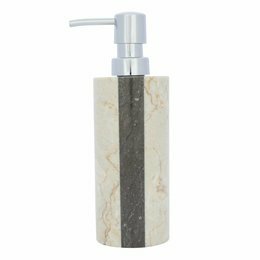 With this beautiful soap dispenser made of cream and gray marble you give your bathroom or toilet the luxurious look it deserves. Height of 19 and Ø of 8 cm. 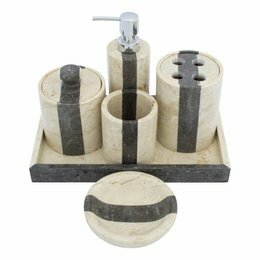 This 5-piece bathroom accessory set Batu consists of a Tray, Soap Dispenser, Toothbrush Cup, Toothbrush Holder and a Jewellery Box. 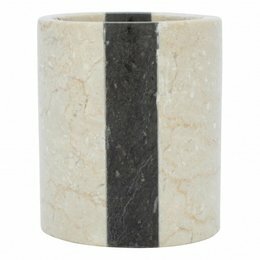 This Jewellery box made of cream and black marble exudes luxury in your bathroom. You can, for example, use it to store your cotton pads. H is 13 cm Ø is 10 cm. 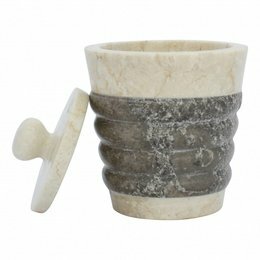 When you have the toothbrushes loose on the sink, it is high time for a beautiful marble toothbrush cup. The height is 10 cm and the diameter is 7.5 cm. 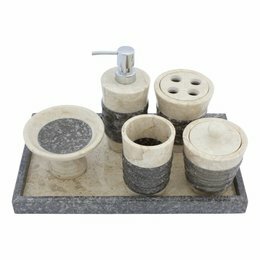 This 6-piece bathroom accessory set Aguna consists of a Tray, Soap Dispenser, Toothbrush Cup, Toothbrush Holder, Soap Dish and a Jewellery Box. 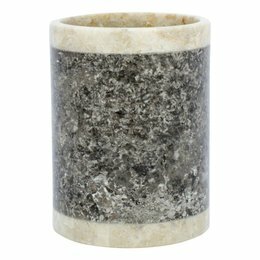 With a toothbrush cup made of cream and black marble, you can bring something beautiful to your home that you will enjoy for many years to come. H 9,5 Ø 8 cm. 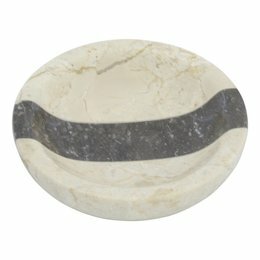 Put this beautiful soap dish on the sink in your bathroom and you will notice that you look at it every time you walk by. Height is 2.5 cm and a Ø of 13 cm. 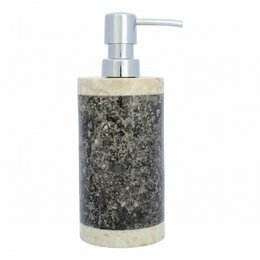 With a nice soap dispenser made of cream and black marble there is no need to put a plastic bottle on your washbasin. Height is 20 cm and a diameter of 6.5 cm. 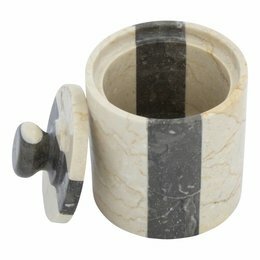 This beautiful jewellery box Imelda is made of different colors marble. The lid is carved out of one piece. The height is 12 cm and the diameter is 10 cm. 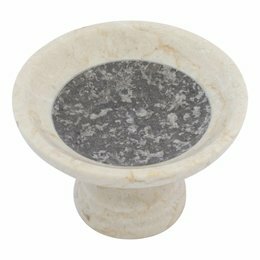 This luxurious soap dish made of cream and gray marble will not look out of place in your bathroom or kitchen. The height is 8.5 cm and the diameter is 13 cm. 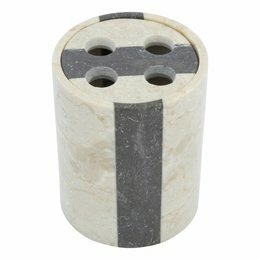 No more toothbrushes on the washbasin with this beautiful two colored marble toothbrush holder. Height is 13 cm and a diameter of 10 cm.